This item has been discontinued by the manufacturer. Great news, Respironics has released the latest in total face coverage. The Respironics Total Face CPAP Mask is designed for patients who have difficulty tolerating other full face and nasal CPAP masks. Some benefits of the Total Face CPAP Mask are a one size fits all and a fast and effective seal with no fitting required. 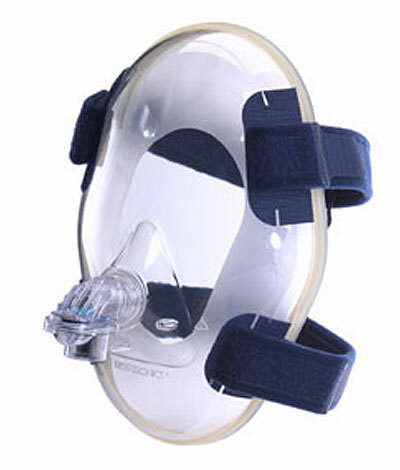 The Respironics Total Face CPAP mask is the original, and once was the only Total Face mask on the market. Used by multiple CPAP users, this mask is designed for a specific population of patients. This mask can be used with CPAP or BiPAP therapy with any pressure range, and works especially well for higher pressure patients. Cushion surface is "polished" to better adhere to the skin and be less likely to leak. Cushion and frame are one piece for an overall lighter mask weight and easier cleaning. Forehead assembly has been redesigned for easier adjustment and forehead pad is a single broad cushion instead of two. Both offer a more secure and stable fit. Entrainment valve opens if pressure drops to 3cm or lower to allow breathing of room air. Swivel assembly moves much more freely than the earlier model. Quick release is easier with ball and socket headgear clips and a built-in hose release.